Paramount's low-budget thriller A Quiet Place debuted with an impressive $50 million this weekend, more than double its $17 million budget. While it likely won't suffer a massive drop this weekend, its box office reign will seemingly be a short one. 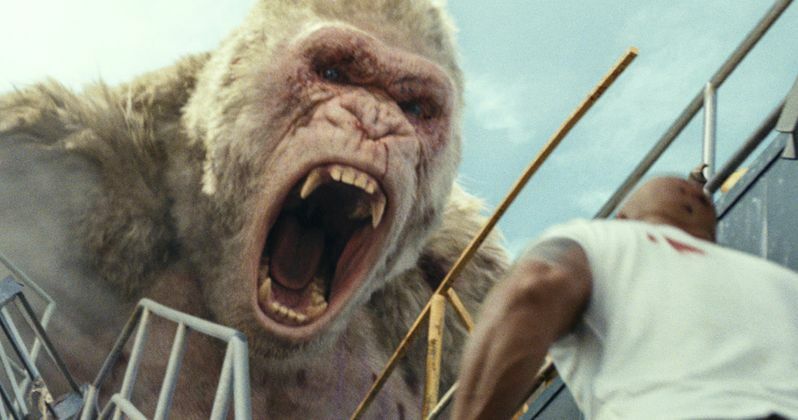 Four more newcomers hit theaters in wide release this weekend, and we're projecting that New Line's monstrous video game adaptation Rampage will come out on top with a projected $42.3 million. This action-adventure will easily beat out Truth or Dare, Sgt. Stubby: An American Hero and Borg vs. McEnroe, along with Isle of Dogs, which is expanding nationwide. Of the four newcomers, and the expanding Isle of Dogs, Rampage is easily the widest release, projected to open in over 3,950 theaters, with its final count most likely coming over the 4,000 theater mark. Universal's Truth or Dare, the latest from low-budget hit-maker Jason Blum and his Blumhouse Productions company, is slated to arrive in roughly 3,000 theaters, while Isle of Dogs is expected to expand to 1,750 theaters, roughly 1,200 more than last weekend. Isle of Dogs is already a hit with critics, scoring a 92% Rotten Tomatoes rating during its first three weekends in limited release, where it earned an impressive $12.1 million, even rising to the 10th spot last weekend when it earned $4.5 million. As for the rest of the newcomers, Borg vs. McEnroe, which stars Shia LaBeouf and Sverrir Gudnason as tennis greats John McEnroe and Bjorn Borg, has scored an impressive 79% on Rotten Tomatoes, but there aren't enough reviews in for Rampage, Truth or Dare or Sgt. Stubby: An American Hero quite yet, but that will change in the days to come. The earliest projections for Rampage put it in the $20 million range, but last month's projections came in at $35 million, and given the rising star power of Dwayne "The Rock" Johnson, who is coming off the surprise global blockbuster Jumanji: Welcome to the Jungle, Rampage is expected to exceed expectations. As for the rest of the newcomers, they won't come close to Rampage or last weekend's winner A Quiet Place, which we're projecting should still be able to capitalize on its incredible buzz and 96% RT score to pull off an impressive second weekend tally of $31.6 million. We're predicting that the top 5 will be rounded out by Ready Player One in third place with $13.2 million, Blockers in fourth with $12.6 million and Truth or Dare in fifth place with $9.4 million. We're projecting the top 10 will be rounded out by Black Panther ($6.1 million), I Can Only Imagine ($5.8 million), Borg vs. McEnroe ($4.2 million) Isle of Dogs ($4.1 million) and Sgt Stubby: An American Hero ($2.8 million). Looking ahead to next weekend, three newcomers arrive in wide release, Fox Searchlight's long-awaited comedy sequel Super Troopers 2, Lionsgate's thriller Traffik and STX Entertainment's comedy I Feel Pretty. Then the massive summer movie season will get started a bit early with the arrival of Avengers: Infinity War on April 27, after its surprise shift from its May 4 date. Take a look at the projected top 10 below, and check back on Sunday for the estimates, courtesy of Box Office Mojo.